It’s that time of year—families, couples, and tourists look for special spots that serve as a backdrop for their holiday memories. 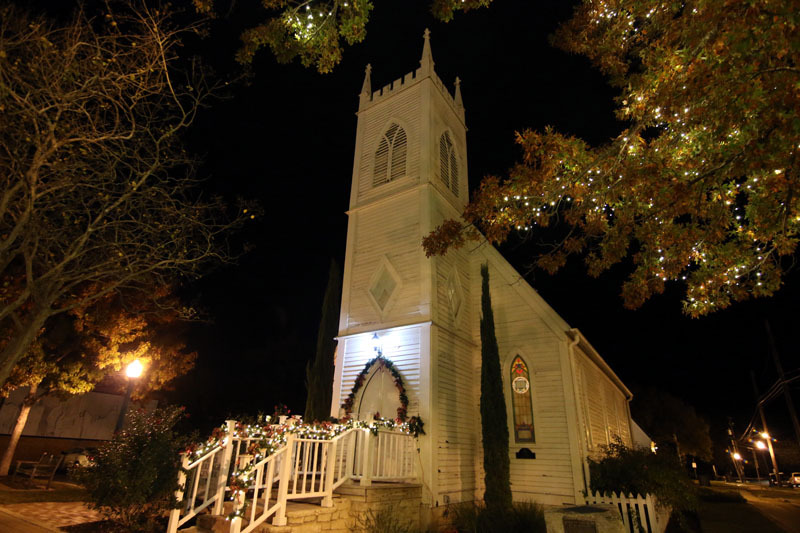 Visiting holiday locations not only affords visitors lovely scenes for their Christmas photos and videos—Texas’ heritage destinations allow folks to connect with Texas’ past and create a measurable impact on local economies. There’s possibly no better example of this phenomenon than communities that host restored historic county courthouses. When you pair an iconic heritage site with the holiday season, the results can be magical. 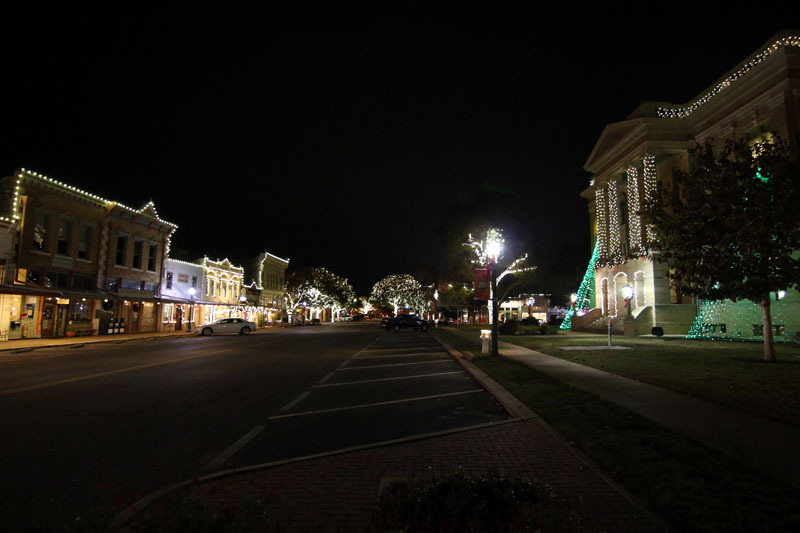 In Williamson County, the county courthouse is at the center of a beautiful National Register District, and the City of Georgetown and businesses in the district lovingly decorate their downtown or “outdoor living room” every holiday season. The Williamson County Courthouse’s history is an eventful one. With the assistance of the THC and the dedication of preservation-minded county citizens and officials, the fifth courthouse of Williamson County has been returned to its original 1911 splendor, once again becoming a focal point of the county. It’s worth a visit any time of year, but a Christmas visit is especially rewarding. The best time to visit the brightly lit square is at dusk or evening, but check business schedules to make sure shops or restaurants you want to include will be open. If you need a “cheat sheet” of spots to check out on the square, visit the Georgetown portion of our Town Square Walk Around mobile tour. Starting at East Seventh and South Main Street, look for the striking Masonic Lodge building, built circa 1900 and now home to Gumbos, a Cajun restaurant. Walking south on Main Street takes you past a number of historic buildings whose storefront windows all feature holiday decorations and displays. Offices of the Williamson County Sun, the oldest newspaper in Williamson County, are on Main Street and also have a state historical marker, one of many located around the square. A block south of the square on Main takes you to the Georgetown Art Center and the Grace Heritage Center at Founders Park, housed in a restored and relocated circa 1880 church. Heading west on West Eighth Street, you will encounter a number of stores and Roots, a bar and bistro that offers food, drinks, and live music on the courthouse square. A block south on Austin Avenue is the Georgetown Palace Theatre, housed in a circa 1926 theater. This season, the venue is staging the “Beauty and the Beast” musical through Dec. 30. On Seventh Street from Austin to Main streets, two of the major historic attractions are the M.B. Lockett Building and the H.C. Craig Building. The block hosts a coffee shop and stores. The centerpiece of the National Register district is, of course, the Williamson County Courthouse, a 1911 Classical Revival brick beauty featuring terra cotta and limestone details and a copper dome. 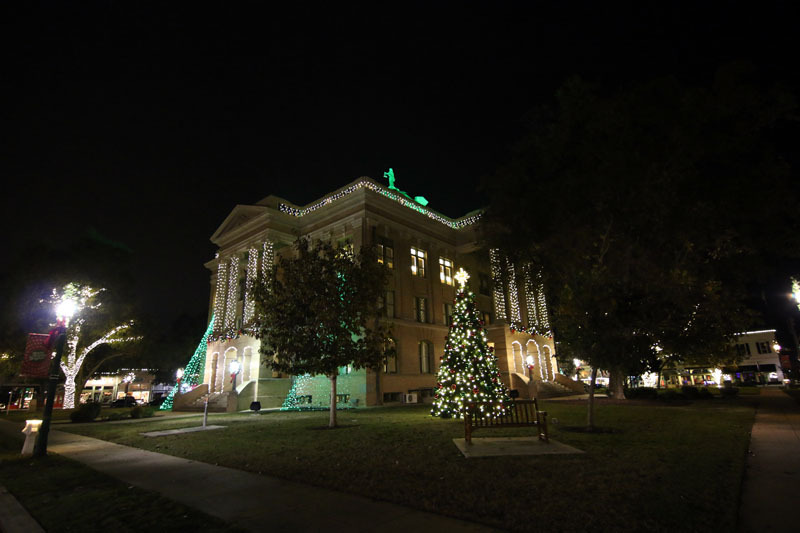 Holiday decorations on the courthouse are tasteful, with one of the most noticeable decorations consisting of green spotlights on the dome and statue of Themis, the goddess of law and order. Less is more with the decorations, mostly consisting of white lights, trees of light, and holly garlands. The beauty of the courthouse is still evident—the decorations merely add a layer of holiday finery to the experience of seeing it. After all, who doesn’t get dressed up to go out during the holiday season? 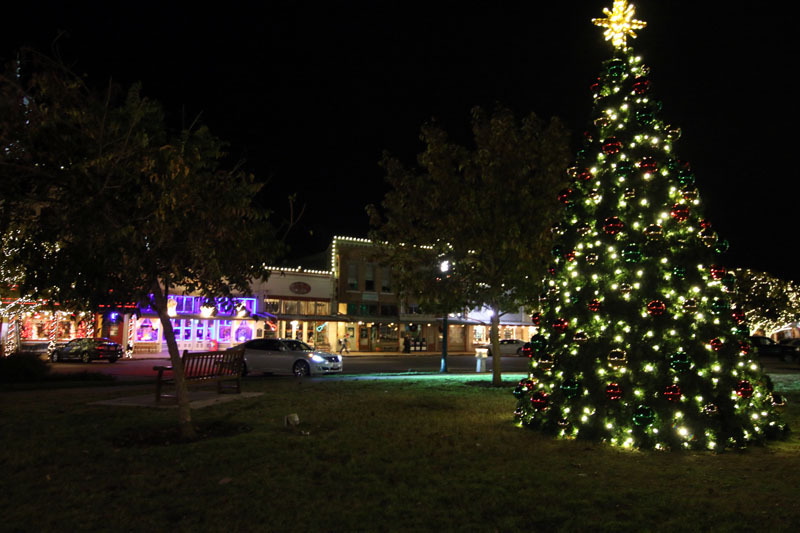 The Williamson County Courthouse square will be lit and decorated through New Year’s Eve—but the iconic courthouse and its beautiful square will hopefully be around forever! And some attractions that close for the holidays—like the Williamson Museum—re-open in the New Year. 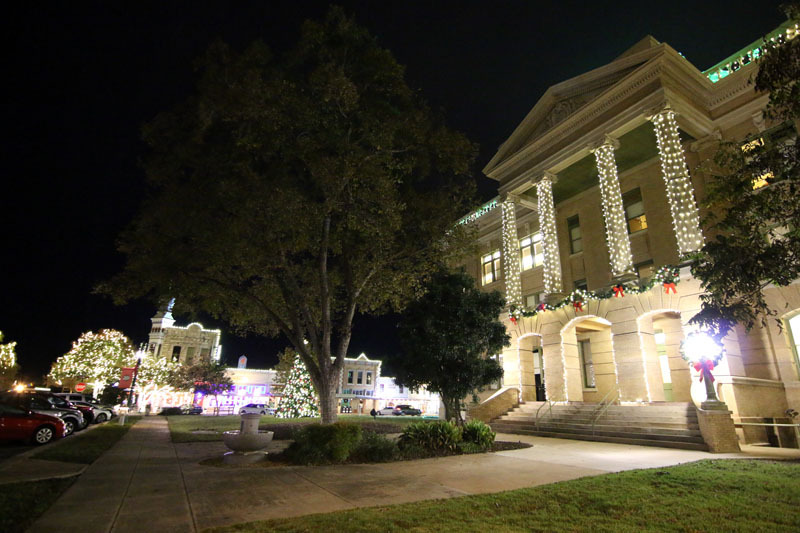 Visits to Texas’ historic courthouse squares are worthwhile no matter the season. Recently, the THC released the Town Square Walk Around mobile tour as part of the Texas Time Travel Tours app. You don't even have to leave your house to experience these great sites—but of course, that's the best way to do it. The Town Square Walk Around tour offers travelers a fun opportunity to take a break from the interstate and explore 13 historic Texas cities between Gainesville and Laredo, including Georgetown. Town Square Walk Around is free and available to view on the THC’s travel website or download on Android or iOS devices. 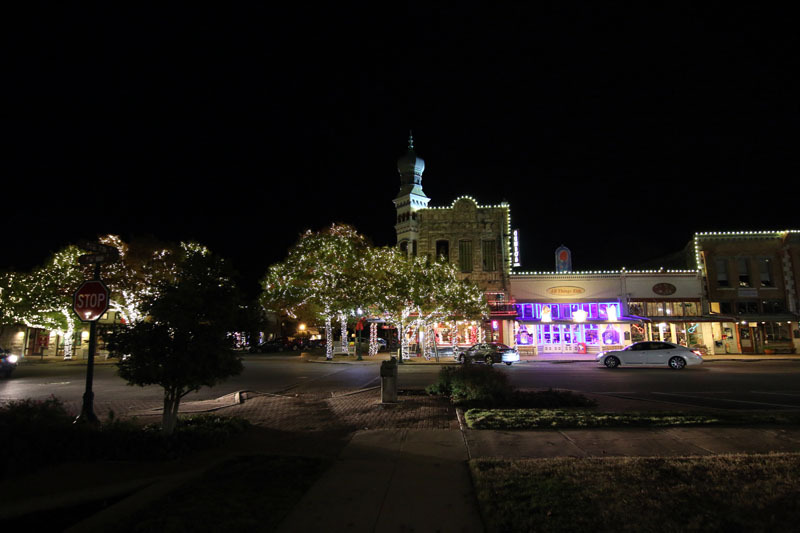 For more fun things to do in Georgetown, see the Visit Georgetown, Texas website. Read more about Georgetown in the Handbook of Texas Online. 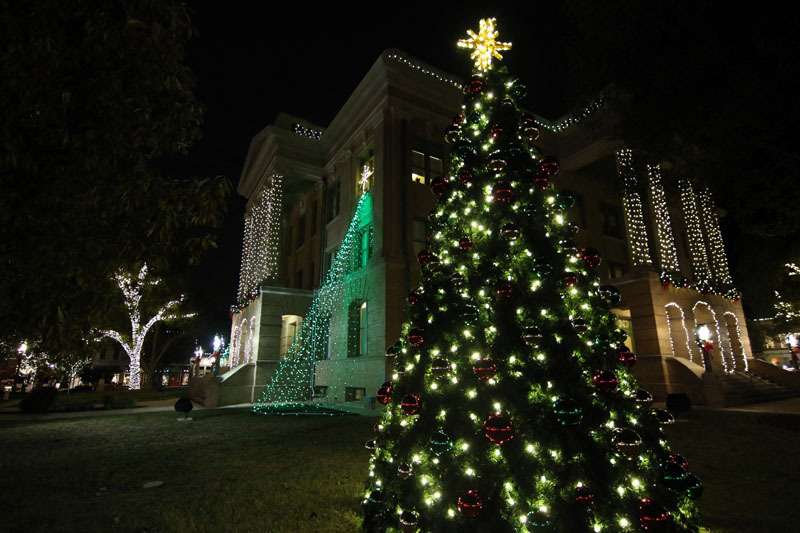 The Williamson County Courthouse and buildings on the square are lovingly decorated every holiday season. Surprised your article did not mention that Georgetown is named for George Glasscock who donated the land in 1848. Born in Kentucky near where Abe Lincoln was born, he migrated to Illinois as did Lincoln and the two men served in two of the same Illinois militia units in the Black Hawk war in 1832 and were in the flat-boat business together (he is only Texan to have been in business with Lincoln). Glasscock came to Texas in 1834 and fought at Siege of Bexar in Dec 1835. He is buried in Austin's Oakwood Cemetery with a Texas Historical Marker.